Sounds good, I'll wait to hear from you. OK - I measured the dustwasher and it is exactly 2" in diameter. 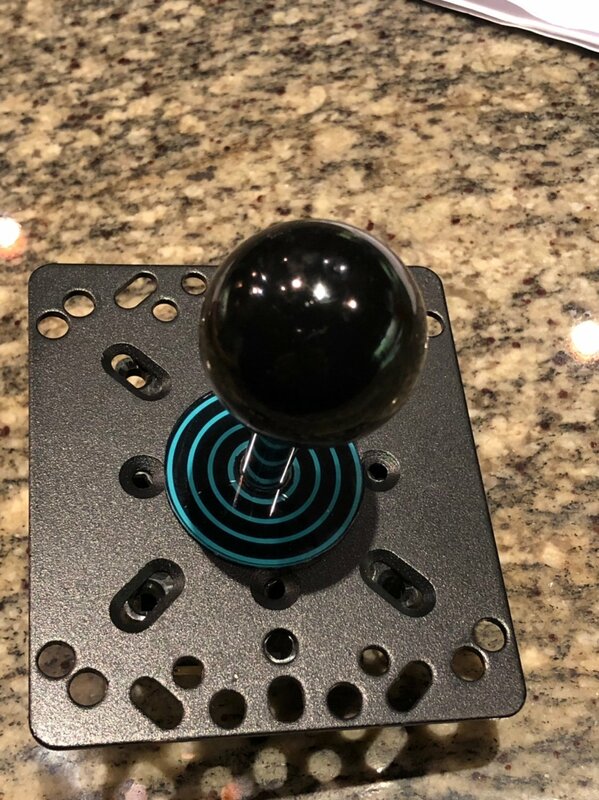 It's a Sanwa and is made for sticks without the cover around the shaft (smaller hole). 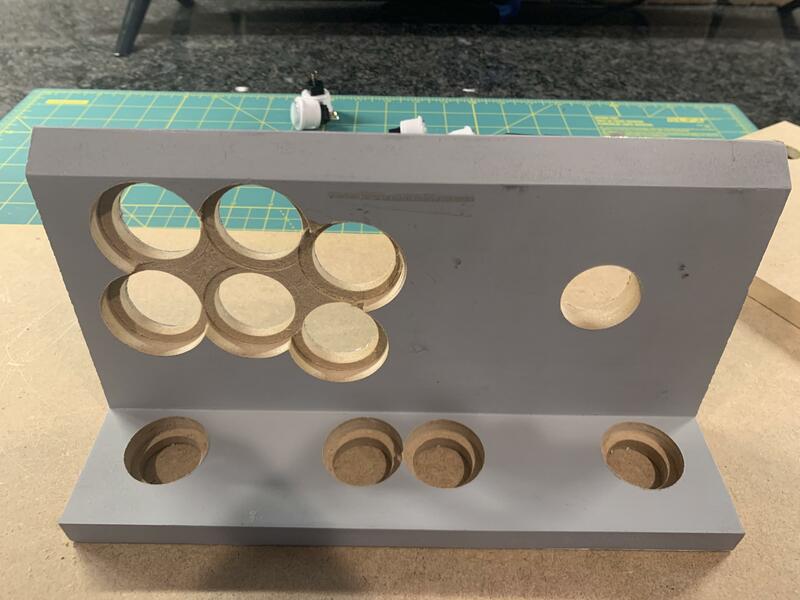 I don't have a clear one but I went ahead and ordered 2 of these: https://www.focusattack.com/clear-31mm-1-16-acrylic-dustwasher-fits-sanwa-jlf-without-shaft-cover/. 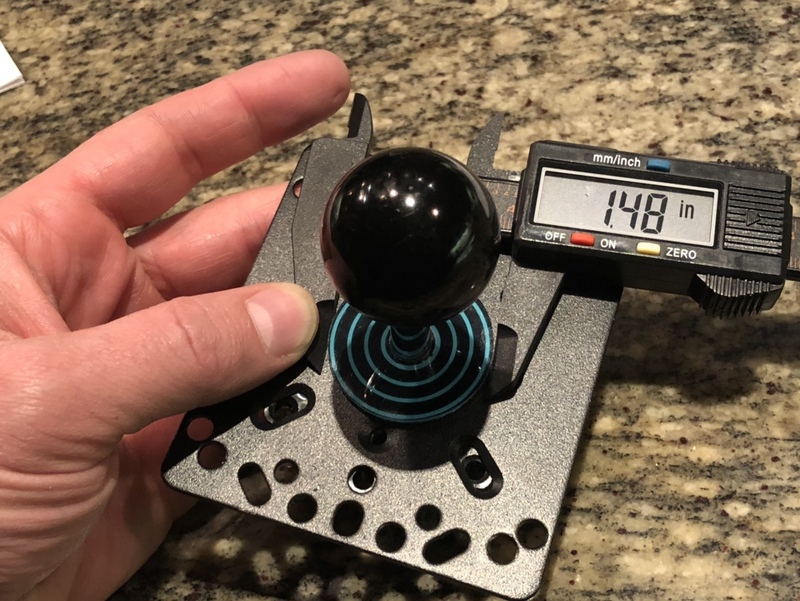 It is a different size than the one I have (31mm vs. the ~51mm Sanwa). When you size the image, can you make it a few different sizes? Like 1-15/16", 2", 2-1/16" for the 2" cover and 30mm, 31mm and 32mm for the one I just ordered? This way, I could just print them all and use the one that fits best. 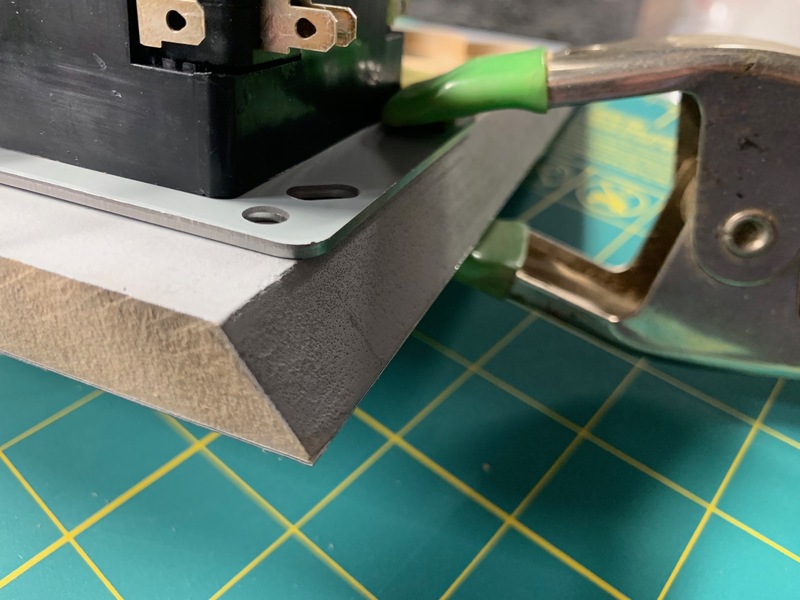 There is a slight lip around the dustwasher so maybe placing the decal inside of that would be best... not sure but I don't think printing a bunch will cost that much more. What do you think? I'm open to suggestions on how to make this work! I'd say first off, determine how it plays being shorter vs longer... pick the one you prefer. Don't skimp on playability over the hassle of having to shave the mounting plate - you'll kick yourself. Secondly, bolts showing is cool. 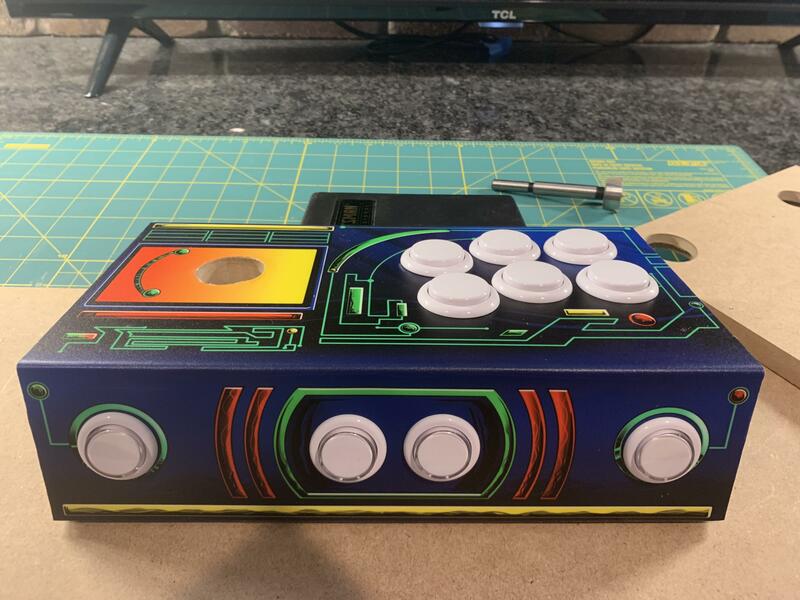 Is there enough space to mount the joystick sideways? Turn it 90 degrees and wire it accordingly? Unfortunately, no. I tried this when I got home from work and it didn't fit. 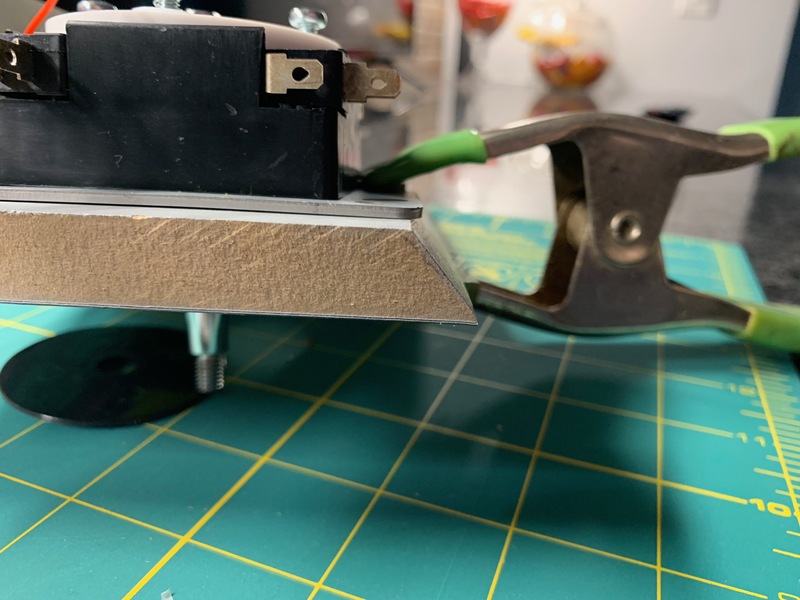 I am using a ServoStik and it has a motor attached to the side of the joystick to turn the restrictor plate so the footprint is quite large. How about removing some of the mounting plate. Looking at mine I could lose an 1/8 and still be able to use same bolt holes. WOW! Blast from the past! Nice to see you still active. Your work is always spot on, great job. I'm due for a bartop someday. mountain holy crap! Nice to hear from you - hope all is well. Get going on that bartop so you can put mine to shame! Sure thing. You want it in separate files or all in one? He has the the JLF size standard, but can cut any size you want. You ordered clear acrylic dust washers from some dirty stranger? I am insulted. Time to go cry in my beer. Just use a grinder with metal disk to remove section of plate..
Ah Mike you know I only have eyes for you ;-). Yeah ask Mike for the dustwashers he does great work, and he party’s like a rock star. Beer at 5am on a Friday eh Mike? Hey. 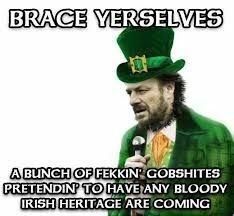 It's St. Patrick's Day...almost. Guinness Beef Stew and toast for breakfast. A nip of Kilbeggan whiskey. My wife was Irish. I am practicing Irish. Sorry Javery, couldn’t help myself, poor attempt at humor. Thanks for the pics. I think I actually like the smaller ones better. The 2" dust washer takes up most of the yellow box on the CP and it's too much. So if the smaller dust washers will work, let's go with that. So I only need 30mm, 31mm and 32mm diameters on the art (I think). Separate files are probably best - when I send them to Scott at gameongrafix I think his printed will cut the vinyl to the exact size I need. Last thing I want to do it try and cut out a circle with a razor by hand! I'm going to have to buy this tool. I have a dremel - maybe one of the attachments will work? Hacksaw seems like it would take forever and just sticking it under the chop saw seems like a recipe for disaster... I'm going to post some pics of the issue so you can get a better idea what I mean. So I only need 30mm, 31mm and 32mm diameters on the art (I think). Separate files are probably best - when I send them to Scott at gameongrafix I think his printed will cut the vinyl to the exact size I need. Last thing I want to do it try and cut out a circle with a razor by hand! I placed the graphic on first and then used an Exacto to follow the dust washer like a template, just like installing sideart. I'd suggest getting a few printed as it can be difficult to get the alignment right. May want to get a couple that aren't pre-cut in case the larger size material helps with alignment (more for your hands to grip on to). I'll work on the art files and send it your way as soon as possible. Question, the circle graphics in the front vary a little, did you have a preference? I used the one on the very left, under the joystick, but maybe you like the one on the right better. OK - so you actually cut them out yourself? I can give that a shot (even though I struggled with the side art haha). I don't have a preference on the art. Whatever you think will look best. So the second pic you posted is a clear dust washer with the vinyl graphic on the bottom? It looks great. Yup, and it actually has some issues in that the vinyl graphic I used had a thicker material underneath it with adhesive put on by the printing company. Didn’t cut as smoothly as I would have liked. With standard vinyl like I have on the main graphics of my control panel however it’s much easier. So shouldn’t be too bad. Bigger issue is getting the alignment right and choosing your adhesive. OK cool - I'm going to go for it. Seems doable. What is the best way to cut the plate? A grinder of some sort seems like it would work but I honestly have no idea as I have never worked with metal before and this is a fairly thick/solid piece. This is probably the best shot to give you an idea of the issue. Here's an overhead shot - super tight fit! The motor just barely fits in there. Going to be fun to wire this panel up! This is probably where I'd have to cut. Clears the bolt holes... although the bolts might present an issue if they are close enough to the angled section (I think it will be OK). Angle grinder for $10 from harbor freight would do it ! 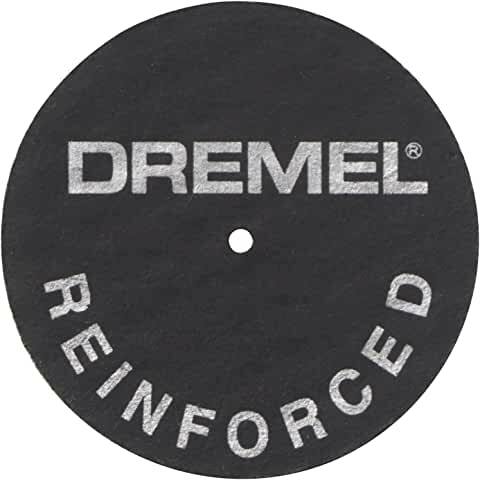 I have a dremel - maybe one of the attachments will work? There are a number of cutoff wheels that can cut through that plate. I'd recommend the 426 (5 pack) or 426B (20 pack) reinforced wheel. 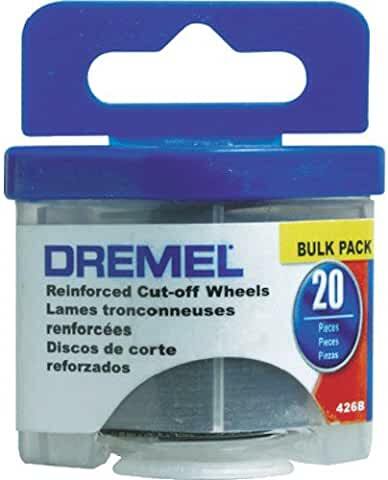 If your Dremel came with them, 420 wheels might work, but they will wear out very quickly and break very easily. True, but it's more of a chainsaw than a scalpel. 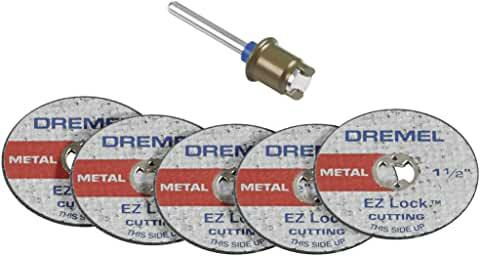 EDIT: Forgot to mention the EZ456 or EZ456B if you have the EZ Lock mandrel. Yep but they'll cut through just about anything and for the price it's definitely worth having around next time you've got to cut through something ! For the amount of steel you need to remove, I'd use a belt sander. 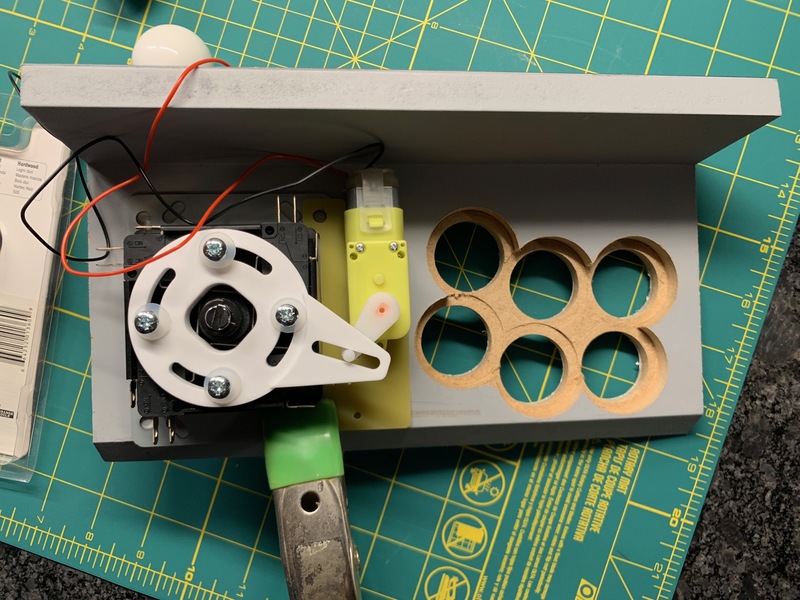 Either (1) route out 1/4" of material under CP to recess joystick and drill 4 holes for through bolts to hold joystick in place OR (2) use 1/2" screws from under side of CP to hold joystick in place. I'd like to do #2 because it is easier but I am not sure if the screws will come loose over time. I think that's it. Not too much left. I hope to at least finish the CP stuff, monitor install and t-molding by the end of this coming weekend. Software stuff will take me a little while because of my brain deficiencies in that area. (2) use 1/2" screws from under side of CP to hold joystick in place. I'd like to do #2 because it is easier but I am not sure if the screws will come loose over time. Just put insert-nuts into the holes. They'll hold the screws. For #2, threaded inserts with wide, flat outer threads are your friend. Inserts with narrow outer threads are . . . not-nearly-as-good for MDF. They are designed for hardwood. 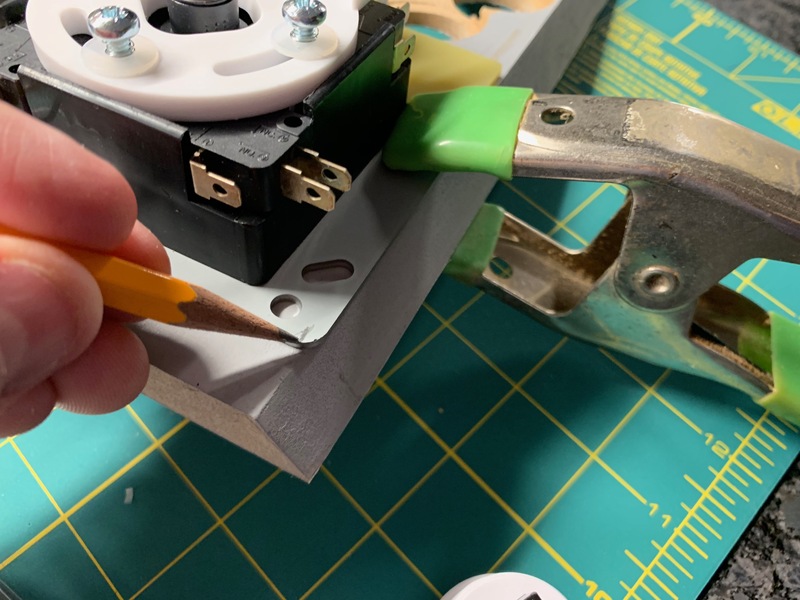 Check out "Mounting controls in the control panel -- Hardware", "Under mount (threaded inserts)", and "Under mount (support blocks)" sections in the FAQ. Thanks - just ordered from GGG. Hopefully it arrives by the weekend! 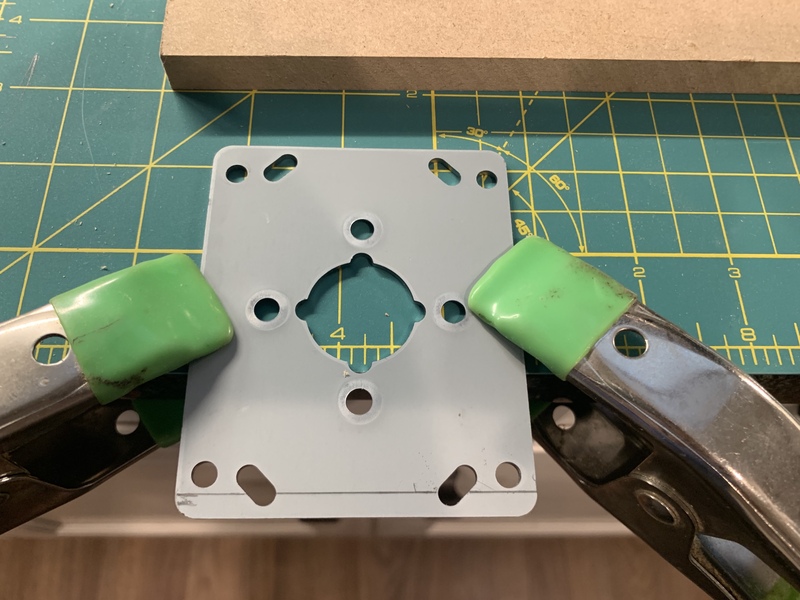 Looks like I'm cutting the mounting plate back instead of sinking it, which I think is the right call. 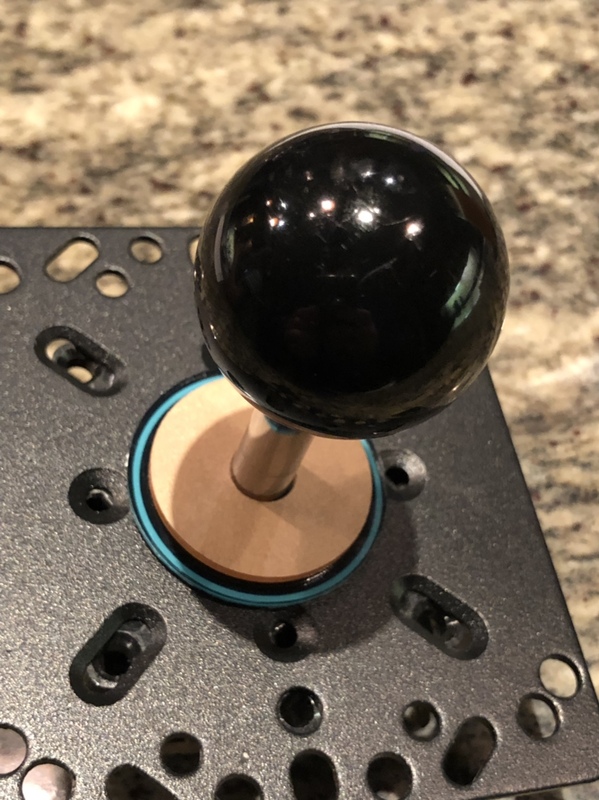 The extra 1/4" height in the joystick doesn't matter and on a build this small I think having the stick sit a little bit lower works better (won't block the screen, looks good proportionately, etc.). I agree, cutting the plate is the right call. Excited to see this one come together. Great craftsmanship. Thanks! I'm taking my time (obviously) but also finding the time has been extremely difficult. I think it is the perfect storm of the ages of my kids. There is always something I have to go to or shuttle them to, etc. There is barely any time to keep the house running (groceries, laundry, lawn care, etc.) never mind extra time for hobbies. Things are actually less stressful at work than they are at home! 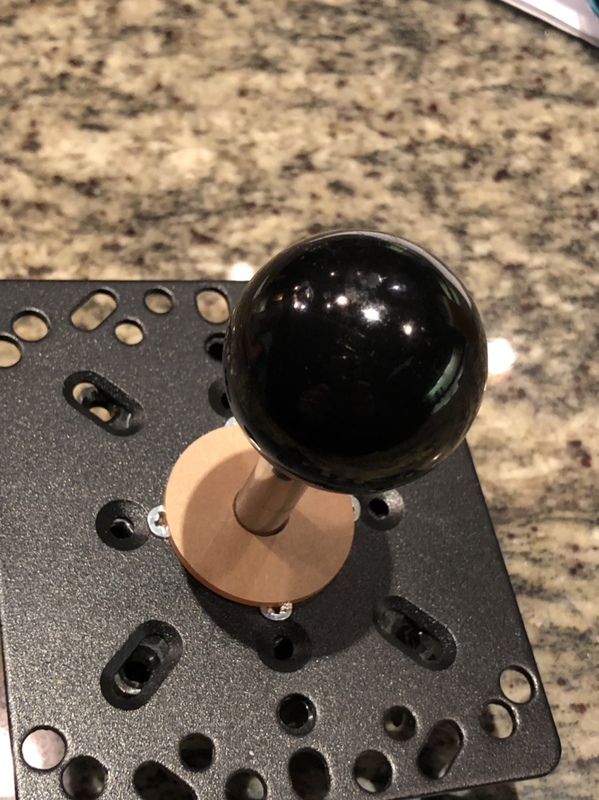 Anyway, I drilled some holes and cut the joystick mounting plate this past weekend. It's progress! Here's a front shot of all 4 buttons drilled down 1/4" except the one to the far right is finished. Here's a close up of the front - I used painter's tape to try and preserve the art. Here's a close up of the back. 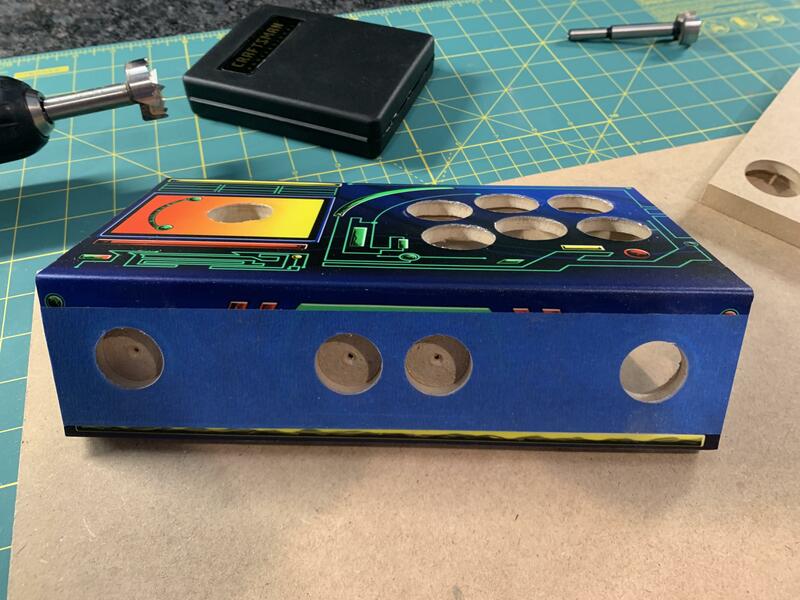 You can see the other pilot holes to the right of the hole that is drilled where the other buttons would go. This entire process would be MUCH easier with a drill press but I don't have one so I had to just wing it. All 4 button holes are drilled out and ready for test fitting. Looking good. 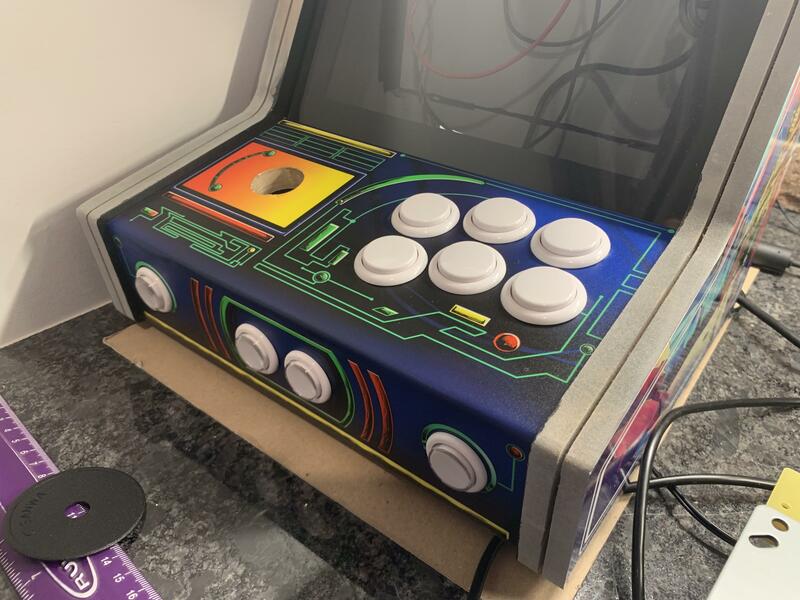 I was nervous about the buttons on the end because they had to be dead on due to the art - I think it came out pretty nice. This is how it will look when the cabinet is finished in 2025. Looking good! Scary stuff done! Thanks Jimbo - I'm also concerned about accidentally hitting the Exit button but I'm not sure I want to complicate matters by adding a hot key function or something. I'm really undecided on the admin button functionality. I know I want Exit and Pause and I need P1 Start at least and probably Select for console games if I decide to add any but not sure how to set everything up. That's future me's problem when I start trying to configure everything. This weekend I should be able to attach the CP to the cabinet. After going back and forth in my head a million times I'm leaning towards using 4 rare Earth magnets - that should be enough to hold it in place while playing. I'm just not ready to drill holes all the way through the CP! If they don't work, I could always add the through bolts later on... probably. This leads me to the second thing I'm going to do - install the joystick using the undermount kit from GroovyGameGear. The issue is that the bolts and inserts are 1/2" so it leads me to believe they are meant for 3/4" panels. 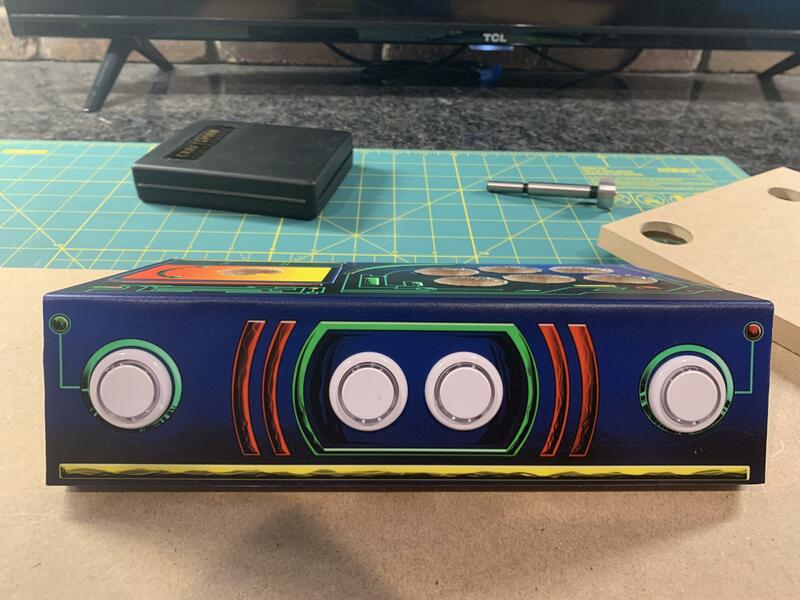 But with the thickness of the joystick mounting plate (1/16") plus the thickness of the artwork (1/64") and maybe a washer I think I could drill down about 3/8" and make it work. I will need to be super steady with the drill, which makes me nervous. If I get these things done, I'll install the monitor and t-molding and then start trying to hook everything up. Finish line is in sight. 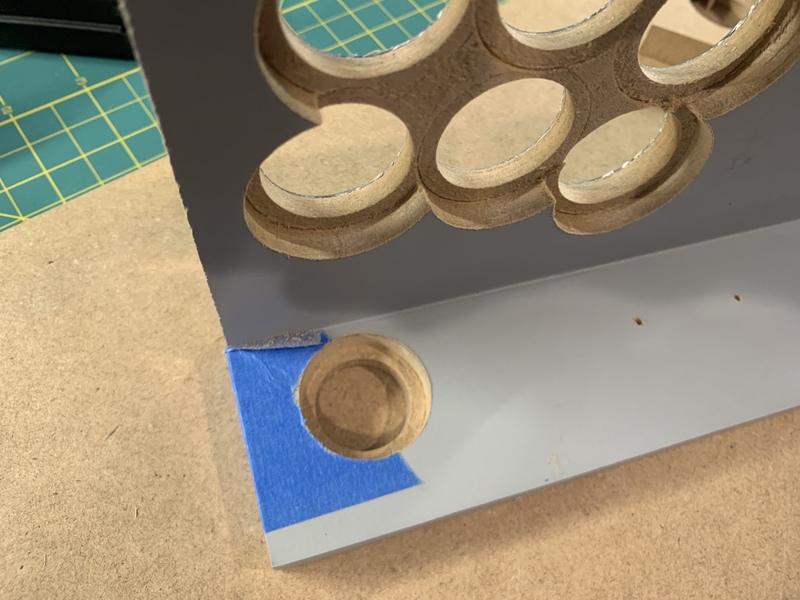 I did manage to cut the joystick mounting plate with my Dremel on Sunday. It wasn't too bad although I probably could have been a little neater. 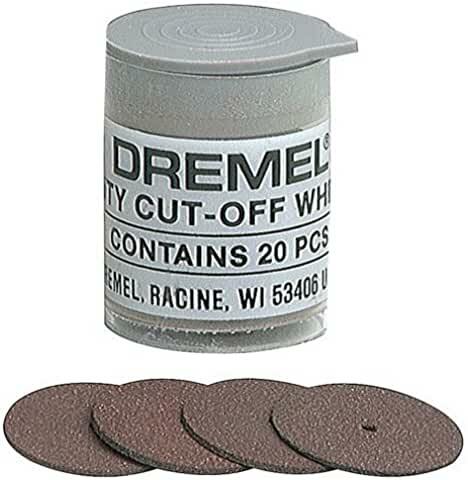 How many Dremel discs did you shatter? Haha - zero actually. I was wicked nervous about it though. I did it in steps - cut about 1/2" on the line and then cut perpendicular to remove that piece and repeated this all the way across. I noticed quickly that I couldn't cut it all in one shot because the disc could get jammed easily. I was also worried that a piece of metal was going to go flying too. Had the heavy duty safety goggles on and everything. I cut it outside on my work bench even though the pics were taken in my basement where I've been working on it. They must make them more sturdy than they used to. I am glad it worked out for you. This should bump the completion date to somewhere in 2525. Current schedule is now bumped up to 2025 - high school graduation present. The default for retropie is start+select for exiting an emulator, which I use on the usb controllers for console games. 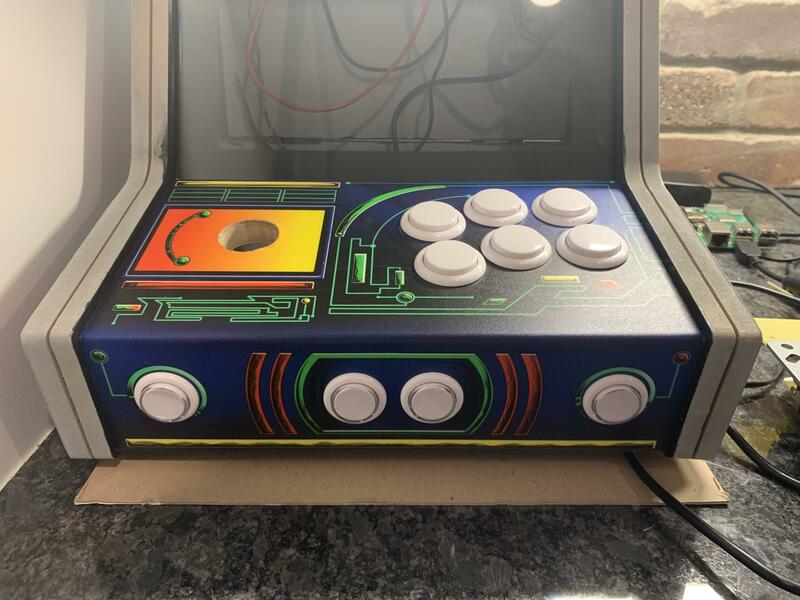 I doubled this up to have the coin button on the control panel mapped to select also. This works fine, people know to hit start and coin together to exit from mame games, and I don't need a dedicated exit button. The *only* problem I had was I put start and coin too close together that they sometimes trigger exit when pressed madly by the kids (although they are aware of it now they do it much less). Is that something I can easily set up? I know the default EXIT in Retropie is START+SELECT but there has to be a way to remap this... I hope. If you take out the hot key trigger, then you can use any of the buttons for any of the hot key functions (but they can't be used for regular buttons). When you set up a controller, just hold down a key for the hot key (long enough to make it cancel) and it will ask you if you want to use the select key as the hot key trigger and say no. That is what I do when using the PI for emulation. I like a dedicated exit button and pause and speedup. Yep you can sort it like that no problem. Good plan. Thanks guys - that's good news. I'm sure I'll have some questions when the time comes but at least in my head everything seems possible! So... 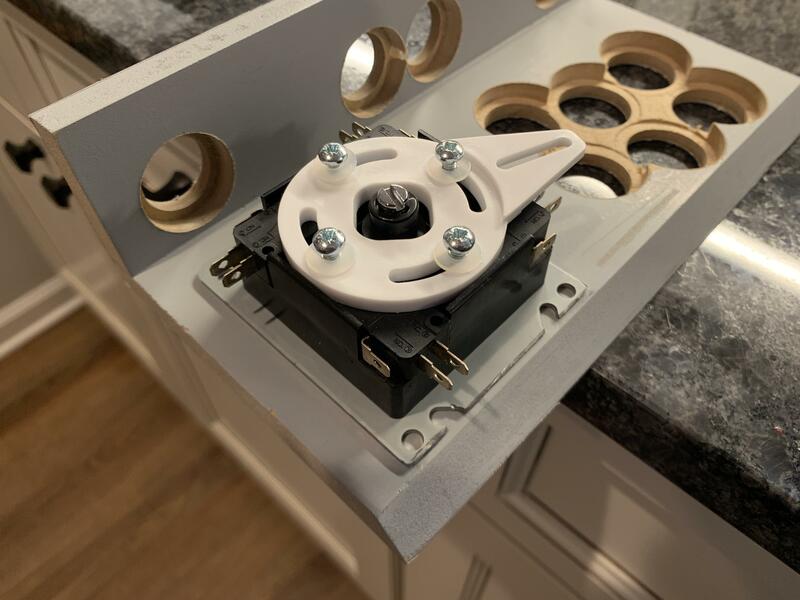 I'm about to attach the CP to the cabinet and I've decided to try using some 1/4" rare Earth magnets to hold it in place. I think with these things in the 4 corners of the CP (8 total magnets) it should be quite secure but I really won't know until I finish and start playing on it. 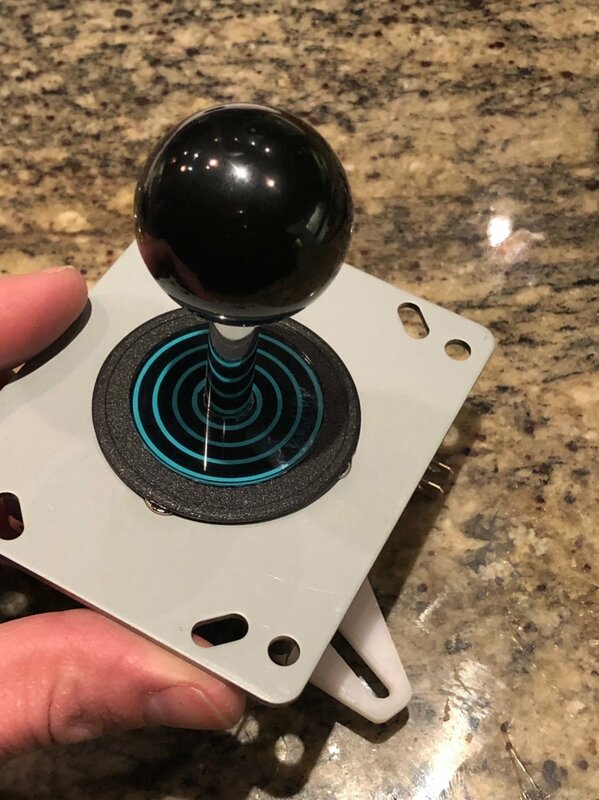 As it is now, there is no side to side movement of the CP and you also cant move it forward and that's with nothing holding it in place so really I'd only have to worry about it coming off if someone pressed down (or pulled up) on the joystick too hard. Seems unlikely. 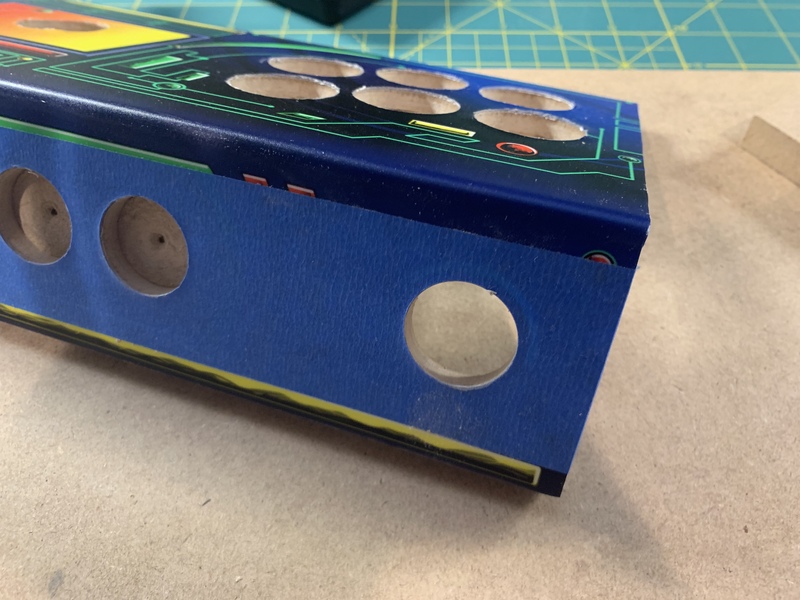 Right now, my plan is to (somehow) locate the spots on the underside of the CP and the 1/2" rails that support the CP where I will carefully drill out a hole the same depth as the magnets. Then I'll epoxy the magnets in place with the tops hopefully being flush to the surface. 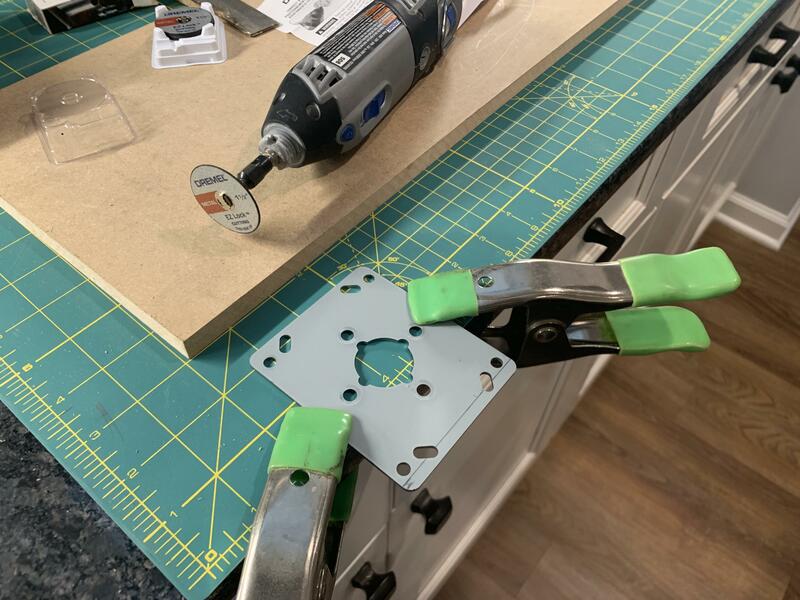 I'm actually going to place the magnets about 1" away from where I would try to use carriage bolts or something just in case the magnets don't work so I'll have a place to drill without needing to remove them. Does anyone have any thoughts/experience with this? Or tips? Any reason not to use magnets that are countersunk and just screw them in? I don't have that much room, unfortuantely. The magnets need to be somewhat tiny because I'm sinking them into the 1/2" wide rails that hold up the CP. I also only have 1/2" of material to work with underneath the CP so screws would likely want to pop through the top. Maybe they make these things in much smaller sizes? Maybe they make these things in much smaller sizes?